Originally published in 1977. Frances Tolmie (1840-1926) was one of the foremost Gaelic folklore and folksong experts. This account of her life and work places her unique contribution to human song against a full personal, historical and cultural background. The book includes a selection of the songs she heard and wrote down, together with the part they played in her life and that of her circle and the larger community. Moving in a variety of circles, Frances Tolmie experienced the warm domesticity of an enlightened Skye manse, the cultural bustle of upper middle-class Edinburgh ‘entrepreneurs’, the romantic serious-mindedness of the first Cambridge women students, the sensitive nature-loving community round Ruskin at Coniston, and spent her later sociable years back in Scotland. This book, with its historical introduction by Flora MacLeod and musical introduction by Frank Howes along with Ethel Bassin's own detailed introduction, reflects her profound study of the song and folklore of her people, and describes how she recorded a precious part of British traditional culture, catching it alive and sharing it as truly as possible. 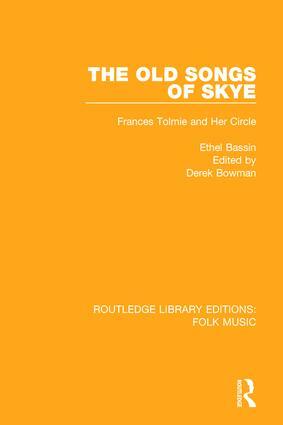 "..a most charming and satisfying story, copiously documented from primary sources, especially correspondence, as well as with the music of the airs and the words of the lyrics Frances Tolmie collected, arranged and put together during her long life…"
Ethel Bassin, well-known teacher and music festival organizer, spent her childhood in Edinburgh, and taught in Portree before going to Canada to lecture in the University of British Columbia on music methods. While there she wrote a number of playlets with English dialogue and Gaelic songs, which she produced at festivals. She then went to London to edit Rural Music, and returned in 1939 to the Hebrides, where she collected folksongs. Later she became Music Teacher at Dingwall Academy in Ross-shire and was still revising this book at the time of her death in 1974.